All hairs are drawn in their proper places. Forewing length 8.3 mm as preserved. We describe a new extinct lineage Manipulatoridae (new family) of cockroaches from the Upper Cretaceous (Cenomanian) amber of Myanmar. Manipulator modificaputis gen. et sp. n. is a morphologically unique extinct cockroach that represents the first (of a total of 29 known worldwide) cockroach family reported exclusively from the Myanmar amber. This family represents an early side branch of the stem group of Mantodea (most probably a sister group of Eadiidae within Blattaria/Corydioidea) because it has some synapomorphies with the Mantodea (including the stem group and Eadiidae). This family also retains symplesiomorphies that exclude a position in the crown group, and furthermore has unique autapomorphies that exclude a position as a direct ancestor of Mantodea. The unique adaptations such as strongly elongated extremities and freely movable head on a long neck suggest that these animals were pursuit predators. 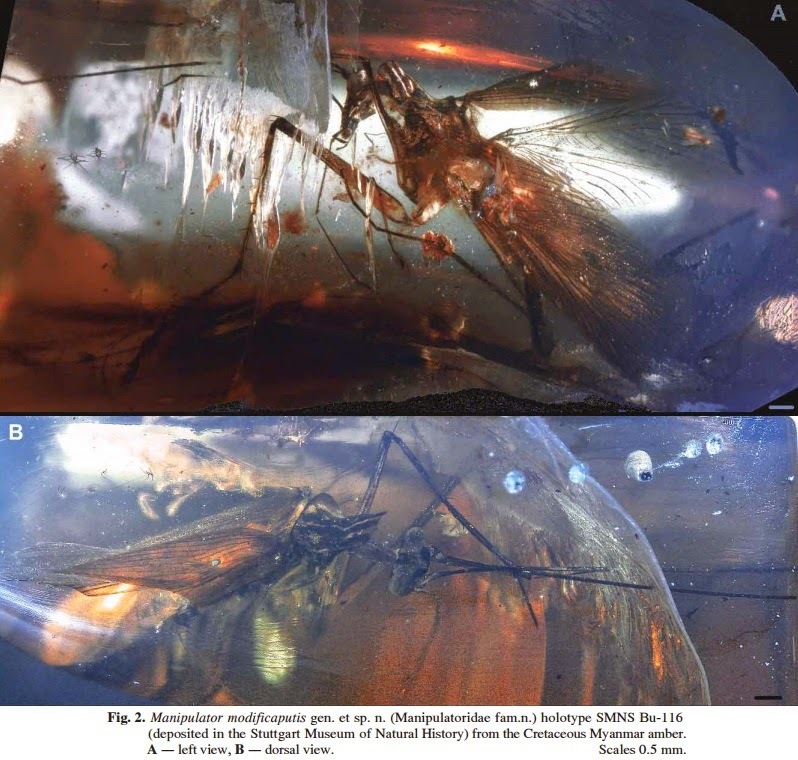 Four additional specimens (including an immature) reported from the Myanmar amber suggest that this group was relatively rare but belonged to the indigenous and autochthonous inhabitants of the ancient amber forest of the Myanmar region. 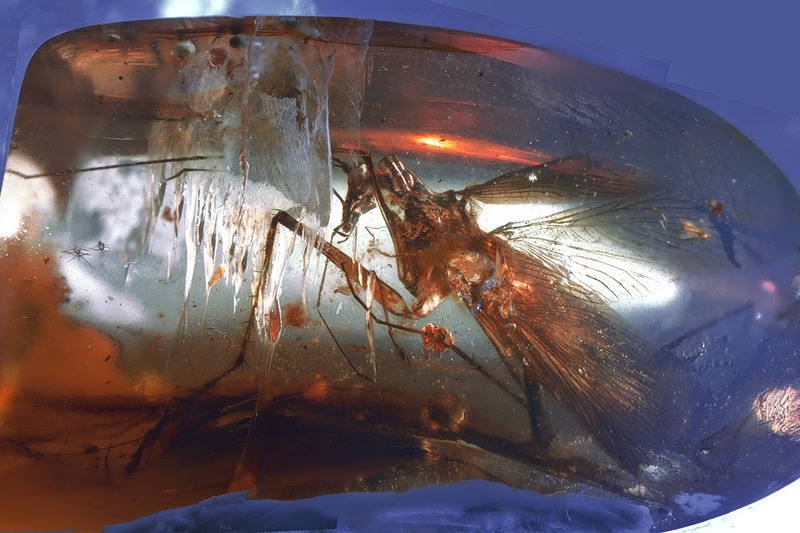 holotype SMNS Bu-116 (deposited in the Stuttgart Museum of Natural History) from the Cretaceous Myanmar amber. A – left view, B – dorsal view. Family Manipulatoridae Vršanský et Bechly, fam.n. Genotype: Manipulator Vršanský et Bechly, gen.n. Composition: Monotypic, only including Manipulator modificaputis Vršanský et Bechly sp.n. from the Upper Cretaceous Myanmar amber. 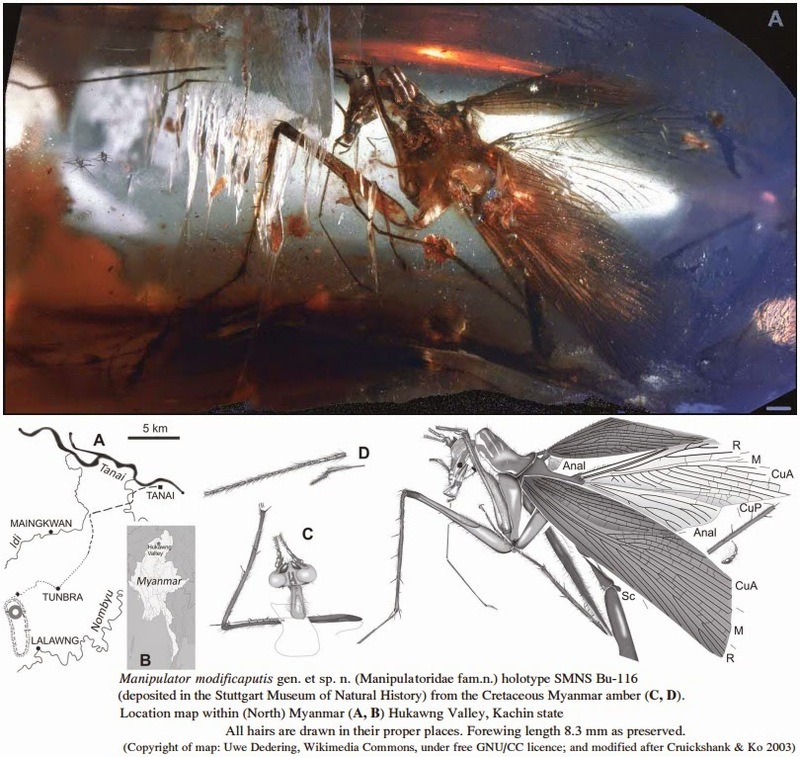 Differential diagnosis: This family differs from all known fossil and living cockroaches by a set of unique autapomorphies, comprising extremely elongated extremities, including semi-raptorial forelegs and extremely long leg-like maxillary palps, modified three basal antennal segments, extremely elongated neck, ocelli with roof-like covering sheaths; elongated saddle-like pronotum; and numerous minute trichoid sensilla (minute hairs). Elongated forewing is unique in having short simply dichotomized at base SC and in dense venation with long A branches within clavus. Description: As for genus and species. Manipulator Vršanský et Bechly gen.n. Type species: Manipulator modificaputis Vršanský et Bechly sp.n. Etymology: Alluding to the extremely long extremities for manipulation of prey. Diagnosis: As for monotypic family. Manipulator modificaputis Vršanský et Bechly sp.n. Material: Holotype specimen no. SMNS Bu-116 at State Museum of Natural History Stuttgart, Germany. Type locality: Hukawng Valley, Kachin State, Myanmar. Type horizon: Myanmar amber (Burmite), Upper Cretaceous, earliest Cenomanian, ca. 99 Ma (Shi et al. 2012). Etymology: Combined from modificare (Latin for regulate) and caput (Latin for head), alluding to the derived head. Peter Vršanský and Günter Bechly. 2015. New Predatory Cockroaches (Insecta: Blattaria: Manipulatoridae fam.n.) from the Upper Cretaceous Myanmar Amber.